We’d love your help. 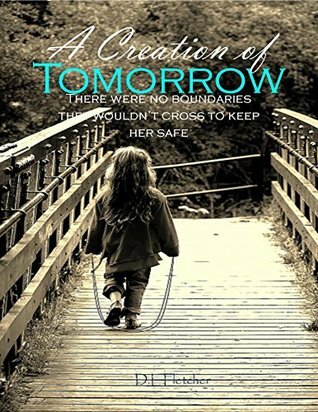 Let us know what’s wrong with this preview of A Creation of Tomorrow by D.L. Fletcher. Alice's daughter now missing, Cami was without a mother, and the one person that protected her from her father's anger. Now Cami continuously wore new bruises. Having no doubt Cami's father Tom was responsible for the bruises Alice turned to the police again and again, but just like when Patsy went missing, they repeatedly turned their backs on her. Alice was desperate to Alice's daughter now missing, Cami was without a mother, and the one person that protected her from her father's anger. Now Cami continuously wore new bruises. Alice was desperate to find help. With nowhere left to turn, she turned to the most dangerous men she'd ever laid eyes on. They didn't wear patches on their leather, and they weren't called by any name, but they were brothers. For Rick running a drug ring was challenge enough. Having each other's back was all that mattered - until Alice approached him. Taken with Alice, and drawn in the moment he looked at Cami's picture Rick ordered Jonathan and Swan to tail the little girl, and find out what they could about her situation. To ask other readers questions about A Creation of Tomorrow, please sign up. I loved the dying butterfly so I gave this one a shot. I really enjoy this author's writing style! Again another self published I assume but another great read. Completely different from the dying butterfly. Romance, drama. Buck is my favorite character and of course Cami. I can see this going into a very interesting lovers triangle. I can't wait for book two to come out. Cami was in trouble, and her grandmother knew. No one believed that Cami was being abused by her father Tom, and the police reports that Alice had been filing were fruitless. Tom was going to really hurt Cami if Alice didn't do something, so she decided to turn to a local gang for protection. She was expecting to have to pay but little did she know, the gang's leader Rick had a soft spot for her and little girls in need of his help. The gang decides to watch this girl in order to find out what h Cami was in trouble, and her grandmother knew. No one believed that Cami was being abused by her father Tom, and the police reports that Alice had been filing were fruitless. Tom was going to really hurt Cami if Alice didn't do something, so she decided to turn to a local gang for protection. She was expecting to have to pay but little did she know, the gang's leader Rick had a soft spot for her and little girls in need of his help. The gang decides to watch this girl in order to find out what her father is really doing to her. They don't mean to become attached to young Cami and Alice, but they do. Now, they have to worry about protecting the two from Tom and from the gang's enemies. This was the longest book that I've read in a while. It actually took me 2-3 days of on and off reading to finish it! But I kept on reading because I just loved the characters so much. I was reading in a lot of different spare moments that I had, just to get a chapter or two in. And even through all of this, I still had that moment at the end of the novel where I thought "that's it?" I didn't want these characters to ever stop talking to me. This book has a nice balance between shocking/sad and cute/relaxing scenes. You would have a scene with Rick's gang fighting or killing members of another gang, and then you would have a scene with the same guys playing with Cami. The author makes sure that her readers know that just because the men are gangsters doesn't mean that they are cruel to everyone that they meet. They can treat a young girl like a princess, and still kill anyone who dares to put her in danger. Some scenes might get a little gory for those faint of heart, but it still was an amazing novel. This was also a semi-realistic portrayal of child abuse. Everyone knew that something wasn't quite right with Cami's relationship with her father, but they couldn't get her to say anything. Bruises aren't uncommon on children, and police reports might not go anywhere for quite a long time. The only way for the gang to find out what was wrong was to see it firsthand. Cami didn't even show signs of being abused emotionally, she had gotten good at hiding things. The gang had to get really close to Cami to get her to say a word about her father. After the father story arc is set to the side, you get to see Cami's life with the gang around her. They became a sort of messed up family, with the gang using the money that they received from their other activities to give Cami elaborate gifts. I was so sad when they worried about Cami's safety from themselves. The romance in this book was also sweet. Rick definitely had a soft spot for Alice, and slowly Alice started to warm up to him as well. I had wished that it had gone further than it had, but it had to end for safety reasons. Such a tragic love story! Then, there is a romance that was introduced at the end of the novel. A bit of a triangle even. I don't know how this will work out, but I will just have to wait until book 2 and see! Overall, this was an amazing thriller. I would definitely recommend it to anyone looking for an adult mystery/thriller novel with a side storyline about family. This book had me - hook, line, and sinker. I read it in two days when I really wanted to finish it in one! The characters were written incredibly well to me, and I was hooked instantly. Alright, this ebook would have been even more amazing had it been properly edited. I'm saying a 5 star instead of This book had me - hook, line, and sinker. I read it in two days when I really wanted to finish it in one! The characters were written incredibly well to me, and I was hooked instantly. Alright, this ebook would have been even more amazing had it been properly edited. I'm saying a 5 star instead of 4 star rating. I had to dock it because there were just so many issues with the grammar and spelling that I had to reread a number of lines to make sure I understood what was going on! Cami is the star of this story. I loved that we saw her grow up almost completely. This book covers 8 years! That's incredible for a story to do, and I thought it was done well. I love the mob feel of the guys. I know they do shady stuff, everyone knows they do shady stuff, but when it comes to Cami they are all smitten, and it works. To say I was pissed at how the Tom issues worked out would be an understatement. That is the one plot point that did not get resolved in this book. It's also one of the key points that really did need a resolution. Everything else was wrapped up quite well. I thought the quote at the beginning of the book worked but didn't necessarily add value to the overall story. A better quote could probably have been chosen. Overall though, I think this author has great potential because I was attached to Cami and Alice instantly. Even Jonathan and Swan piqued my interest as they grew to love Cami. Fletcher has a way of making you want to know what's going to happen to the families they've created. I have had an infatuation with pens, paper and note pads since I was a small child. This love affair is still as strong today as it was when I first learned to write cursiv I am a Canadian full time employee - mother of two - grandmother of two - married to a wonderful supportive man who writes in her spare time. I am trying to live at least part of my life doing what excites me the most.